Transform your vacation pictures into living nature sceneries with Nature Illusion Studio..Nature Illusion Studio allows you to apply various effects such as water, weather, animated objects, or sound effects on any image to emulate various natural phenomena..With the combination of both visual and sound effects, Nature Illusion Studio can produce very realistic animated nature scenes such as waterfalls, lakes, or seas..Once you have created the nature scenes, you can save it as screensaver, executable, gif and avi files. 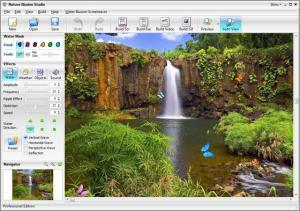 You can download Nature Illusion Studio free here. We do not allow the inclusion of any Nature Illusion Studio serial, keygen or crack and we disclaim any liability for the inappropriate use of Nature Illusion Studio. FindMySoft advises that Nature Illusion Studio should be only used in accordance with the rules of intellectual property and the existing Criminal Code.